Well, in the long run, not much at all. The two McLarens had been fast all weekend, with Button leading the way in P3 earlier; there is some question as to just how much wing they're running, however. This could be massively important, as the forecast for Sunday remains a race aquatic. If they're running a dry setup, it only figures they'd be faster than a car prepared for a wet race... and they'll drown come Sunday. If, however, the McLarens are this fast without compromising a wet setup... well. It's no surprise to see the two Red Bulls up towards the top of the sheet, obviously. It IS a little surprising to see HWMNBN so far down, but we don't know how heavy the team went with the weather setup. He might be in the best shape of the bunch if they've really cranked on the wing. We just won't know until the race begins... assuming it rains. And every red-blooded F1 fan has gotta be hoping for rain. You know that Ferrari has mechanics behind their pit stalls making carbon-fiber rain turtles. One still has to give Vettel the advantage at the moment, though. We will see tomorrow, won't we? The race is in the morning, F1U! thereafter. See ya then! Post contains 444 words, total size 17 kb. 1 I imagine Vettel and HWMNBN are both running as much wing as they dare, with Vettel being willing to run a bit more, since he doesn't even need to end up on the podium to win the WDC. The last Friday of the 2012 F1 season brought us what might well be the last sunny day of the weekend; the forecast for Saturday is for rain which might hold off long enough to get Quals in the books. Sunday, on the other hand, calls for a grumpy old man (Bernie?) with a long beard (not Bernie) building an ark in the infield section of Interlagos. Probably because Ferrari is sending the team jets over São Paolo every half-hour, dumping oil drums of silver iodide into the clouds. Hey, anything to help HWMNBN, right? It turns out that there's a lot of lasts happening this Sunday. It's the last time the Legendary Announce Team will be together on SPEED. I've already gone over my views of that tragedy, so I won't rehash them here, but I will point out that they were reminiscing something fierce during the P2 broadcast and were incredibly funny in the process. If you've watched a few races in the past, Quals might be worth watching for that alone. It's also the last race Shiv Hamilton will be driving for McLaren. Fresh off his victory last weekend here in the good ole U-S-of-A, he's apparently trying to go out in style; he was the fastest in both P1 and P2. He's already admitted that he doesn't expect to be competing for victories next year with Mercedes, so this might be the last chance he has for a win in a while. There's also the shot to play spoiler in the great HWMNBN vs Sebby V battle, can't forget that. Sunday is also probably going to be the last time we see HRT ever. They've been running on the proverbial shoestring for the past three seasons, and reports are that everybody who isn't on the team's flyaway crew has been pink-slipped. The race team will get their termination notices upon return to the factory in Spain after Sunday. At this point, I'm seriously rooting for them to earn a point on Sunday... the influx of cash from the TV revenue they'd earn might be enough to keep 'em alive. Otherwise, we'll probably have another SuperAguri situation, where bits and pieces go up for auction. That'd be a flat-out shame... they gave it a good shot and deserved some small success, instead of being a constant laughing-stock. Then finally, this is also the final weekend for one of the greats of the sport. It just won't be the same without Gandalf Kobayashi, who seems to have lost his seat at Sauber in 2013 Michael "Slappy" Schumacher. Consider this: if either Vettel or HWMNBN win the championship, it'll be the third of their career. Schumacher has SEVEN, including five in a row (2000-2004). He has more wins than many of the drivers in the field has starts. He has over 300 starts, 68 poles, 77 fast laps, and on and on. The past three years have not been kind to his legacy, but he should still go down in history as arguably the greatest F1 driver of all time (and if not, one of the top three for sure). I'm not going to say that I like him, because that'd be a flat-out lie, but one can't be a F1 fan without acknowledging his level of excellence. His helmet this week bears a legend: "Life is about passions. Thank you for sharing mine." That about sums it up. Post contains 578 words, total size 4 kb. I dragged myself into the Duck U Bookstore today, the way anybody who's in the middle of a really short work week does. All in all, just a 'meh' sort of day, y'know? Yeah, you know exactly what I'm talking about. Where was I? Oh, right, right, dragged myself into work, expecting I'd just be doing another day of entering textbook adoptions, getting ready for end-of-semester buyback, that sort of thing, when Our Man Dan walks in. Dan, you may remember, was brought in by the Foodservice company that serves the Circuit of the Americas to help with the 2012 United States Grand Prix. He was also supposed to bring back some souvenirs of the circuit for me... and in this, he succeeded beyond my realistic dreams! Here's the whole thing; click on the picture for a larger version. 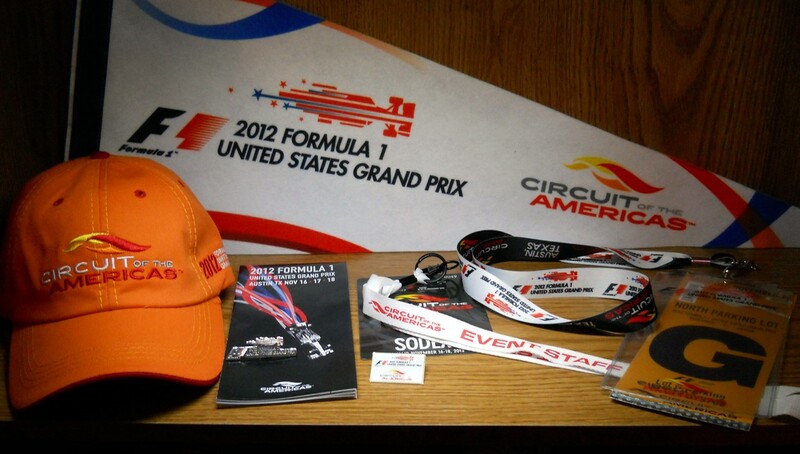 What we've got is the CotA ballcap with the 2012 USGP logo on one side, and the trackmap on the other, the official CotA schedule/map, a couple of pins, a CotA Event Staff lanyard, a regular CotA lanyard with a staff parking pass, and of course the pennant in back. Baby! I was just blown away by it all this morning. It turns out he wasn't stationed at Turn 19, as they had originally planned, which is why he didn't bring me in any carbonfiber shards. No, instead he was all over the circuit, and apparently has already been told that he'll be back next year. And so will I... I've already made the decision, I'm gonna be there in 2013. 1 That is really cool! Do you think your friend would consider selling the two pins for $50? I'm working as a Flag Marshal at the event. I'll be there Thursday through Sunday this year. I don't know what station I'm working right now, but expect to shortly. Please use my email above. Thanks, Scott. 4 Actually, Scott, the pins are mine... and while I may be down on F1 right now, I'm still a fan. They aren't available at any price. However, it's ridiculously cool that you're a Flag Marshal for the race this year! Autodromo Jose Carlos Pace, colloquially known as Interlagos, has been the home of the Brazilian Grand Prix (that's a lot of grands prix!) since 1973, and has been my least favorite circuit ever since I became a huge F1 fan in 2004. It's strange that I hate the track so much, since it's got a lot of the features I regularly like. First and foremost, it's not flat. The start/finish straight is the high-altitude mark of the layout, but it rapidly dives away at Turn 1 to Turn 3. It stays flat all the way to Turn 11, then begins to regain all the height lost from Turns 12 to 15. It's this uphill climb where we've seen the most exciting finish to a Formula 1 season ever, in 2008. Ferrari's Felipe Massa had won the race, and what appeared to be his first Driver's Championship as well. His only rival, McLaren's Lewis Hamilton, was in 6th place, but needed to finish 5th to win the Championship... and he'd just been passed by a young driver named Seb Vettel, driving for Toro Rosso. It looked like Massa had his elusive Championship... until Tim O'Glockenspiel, driving for Toyota, nearly spun his car in wet conditions in Turn 14 on the last lap. Hamilton got past him for 5th and his first Championship. This year, rain is in the picture again, with thunderstorms on tap for Saturday, and rain on Sunday. It's 2008 all over again, and god help me I'm rooting for HWMNBN. Well, that's not really true... I'm more rooting against Seb Vettel. I don't want him to win three championships in a row, so sue me. Rain is another thing we often see at Interlagos, and that often leads to fun races. It's also a fast track, with only the twiddlybits from Turn 6 thru 11 being slow-ish. The rest is nearly all flat-out. I'd always rather see race cars going quickly than going slowly, so again, I should like Interlagos. But I don't. It's always seems grey there, and it's dangerous to boot (three racers died there in 2011). And it's the end of the F1 season until March. How can anybody like that? THIS year, it's also the end of the Legendary Announce Team, as F1 leaves SPEED after Sunday. We've still got them for one more race, so let's enjoy it while we can. Here's the schedule of events. Of course, F1 Update! will be all over the weekend, though we may take a miss on the streaming things. We'll see you then! Right, it's race day in Austin! It's 71 degrees and sunny at the Circuit of the Americas, and Ferrari are playing tricks! Let's get to the pre-race stuff. In an attempt to help HWMNBN's chance at the Championship, Ferrari has come up with something legal, but sneaky. Felipe Massa, who qualified ahead of the Spaniard, had to "change a gearbox" about two hours ago, and will take a five-spot grid penalty. As a result, HWMNBN will now start on the clean side of the track in 7th, not in 8th on the dirty. The team has actually come out and admitted that they've done this "for strategy considerations." Clever, very clever. Shame for Massa, who honestly couldn't have expected to be allowed to stay ahead of his teammate at any time. The drivers are saying that starting on the dirty side of the track is like starting on a wet track with slick tires. Look for HWMNBN to make quite the jump at the start. He has to if he wants to win a championship. If he finishes worse than 5th and Vettel wins, the championship is over. There is no way that HWMNBN can win the championship today, unless Vettel gets injured and can't start in Brazil... and nobody wants that. Now THAT'S a flyby: one F-16, one P-38, and two P-51s! I'm gonna enjoy the race instead of writing anything about it. See ya with the F1U! UPDATE: Now THAT'S how you do a race! If every USGP is gonna be like that one, F1 is gonna catch on here big-time! F1 Quals: 2012 United States Grand Prix! (PRE-SESSION) Here we are, with the first session that actually means something this weekend! Having said that, we don't know how much it means since the Circuit of the Americas is a brand new track. It could be that it's an awful racing circuit that encourages nothing but parades meaning that qualifying position is incredibly important... or it could be that it works so well that the winner can come from anywhere on the grid! We just don't know right now... but we will soon. Here's what we DO know already: Lettuce Grosjean did indeed have to change his gearbox, meaning he's got a five gridspot penalty ahead of him. Nobody pitted. The tires were so difficult to get heat into that everybody stayed out and just kept running and running and running... until Narain Kittylitter came to a stop just off track at Turn 2, probably out of fuel. This brought out a yellow flag, meaning that it was going to be very difficult for drivers to improve their positions. For most this was okay, but it meant that Nico Rosberg needed a heckuva lap to get himself into Q2... he got it, but only just: he finished 17th. Those eliminated, from 18th down: Daniel Ricciardo, Tim O'Glockenspiel, Charles ToothPic, The Red Menace, Heikki Kovaleinninninnie, Pete Rose and Narain Kittylitter. Both HRTs came in under the 107% rule, so they get to race on Sunday without begging the stewards for permission. Nobody pitted again... except for Jenson Button. He "lost the power, lost the power" with three minutes and a full track to go, and somehow managed to limp back to the pits. When he made it to the pits, he was 8th on the board. By the time the session was over, he was bumped to 12th and out of Quals altogether. SPEED managed to catch the team working on something at the front of the car (throttle pedals?) just before Quals began, and McLaren's engineers dove right for the same spot on the car when it came to a stop. Those eliminated from 11th down to 17th: Bruno Senna, Jenson Button, Paul diResta, Jules Vergne, Sergio Perez, Gandalf Kobayashi, and Nico Rosberg. Amazingly, this is Vettel's 100th Grand Prix, and his 36th pole. Good lord. This is a terrible result if you're rooting for HWMNBN; ninth is horrible. Two places behind your teammate is even worse... and this is a guy driving for the Championship! Then again, Vettel has completely dominated this race weekend, so it's not exactly a surprise that he's gotta be the favorite tomorrow. Right, the 2012 United States Grand Prix will be on Sunday, with the F1Update! coming sometime thereafter... we might have some in-race comments, too. We will see you tomorrow! Post contains 701 words, total size 19 kb. 1 It looked to me as if Button's front end pushed & there wasn't much grip. Both the RB's & Hamilton seemed to go when & where they wanted. 2 vK, you may well be right. One thing I've learned while doing all the liveblogging and streaming stuff, particularly this weekend, is that I get so busy that I don't get to notice the details like that. Just broad-brush things only. That being said, if I said I wasn't having a ball, I'd be lying. F1 United States Practice 3: Liveblogging! (PRE-SESSION) So here we are again! It's 45 degrees and sunny at the Circuit of the Americas, looking for a high of 68. That's a little cooler than F1 tires like, but it's certainly good enough. In any case, Practice 3 is only 60 minutes in length, as opposed to the usual 90. I'll be using the time remaining as the time notation: if you see (45:30), that means 14.5 minutes have gone by in the session. Read from (60:00). Please keep all extremities inside the blog at all times. Wonderduck's Pond is not responsible for any injuries incurred in the reading of Wonderduck's Pond. Post no bills. Accept no substitutes! (60:00) Look, we've gone green on Saturday! First out is Gandalf Kobayashi on SPEED's streaming site. (57:52) Wow, 60000 people at COTA yesterday, 80000 expected today? There are a dozen actual races that don't get that many spectators on the calendar! (55:37) Sebby Vettel very nearly pranged his car in the pit lane. Whoopsy! (53:55) Narain Kittylitter is third on the time sheets as SPEED goes to commercial... that might be the first time I've ever seen his picture on the screen during a session. At least, on the "first page," not at the end. (50:11) Just a picture, nothing really happening. Kimi at the far end of the esses. The rest will be below the fold. Post contains 843 words, total size 6 kb. 1 Hey WD, do you know what the little 'battery' symbol above the DRS is for? And are they using blowers on the cars when they're pitting? Are they that starved for air at a stop? 2 It's the KERS charge status - it's full if the whole bar is red. When the driver activates it, the yellow border appears around the bar. F1 Practice 2: United States! There are moments in time where I wish I didn't know as much backstory to things F1-related. One of those moments occurred during Practice 2, with about 34 minutes left. The Legendary Announce Team was bickering amongst themselves, mostly Matchett and Hobbs giving The Varsha grief about his focus on someone reaching the 200mph point for the first time. Finally, The Varsha plaintively said "C'mon guys, work with me... there's not much time left." I get the feeling that he wasn't just talking about the practice session. In that practice session, we saw a lot of running by everybody but Seb Vettel and the two HRTs. The Spanish team is having financial difficulties, and stopped short of saying that they weren't running because of that. If you've got $40million lying around, you can buy the team! And if you do, let me know... I'd very much like to talk to you about a Wonderduck's Pond sponsorship sticker somewhere. I'd also like to know just how the heck you can afford $40million and you haven't mentioned it before this... but back to F1. Seb Vettel missed a good chunk of the session with his car up on jacks, leaking coolant fluid from its KERS unit. As the Legendary Announce Team pointed out, if you were going to have a problem, this was a good one to have because Mark Webber had the exact same problem at Abu Dhabi. The team already knew how to deal with it! It still took most of the session, but Vettel still had enough time on track to break the 1:37 barrier, ending the day with a 1:37.718, almost three-quarters of a second faster than Webber and HWMNBN, and over a second ahead of the two McLarens. Yeeeeeesh. I'm going to gush a bit more about the Circuit of the Americas now. We may not get a good race on Sunday, seeing how Vettel is looking like he's got a JATO unit stuck up his backside, but it won't be because of the track. I'm already convinced that it's the best new-style circuit on the calendar, and it matches places like Montreal and Suzuka. It may even move into the Silverstone/Spa level of racetrack if we get a good race on Sunday. I'm probably overrating it because it's an American track, but I'll be darned if it isn't just perfect. Baby. P3 tomorrow at 9am, I'll be livebloggin' that. Quals at noon, and I have no idea what I'm doing for it! How do you liveblog quals??? See you tomorrow! 1 Varsha's comment was a bit poignant. But I'm glad to see that NBC has picked up Matchett and Hobbs, and will be teaming them with Leigh Diffey next year. Varsha apparently has a year left on his Fox/SPEED contract; hopefully NBC will pick him up for 2014 and reunite the whole Legendary Announce Team. 2 I've not yet seen that confirmed anywhere, FDM. I've seen only one tweet from Jenna Fryer, and that's it. I'd never even heard of her before this... until I get some sort of report from a source in good standing (like Matchett, or NBCSN), I'm not going to count on it. It is true that The Varsha has another year on his contract, though. He himself said so in the reddit AMA he did a few weeks back. F1 United States Practice 1: Liveblogging! (PRE-SESSION) The day has finally come. In just a short while, we will see actual F1 cars running on Austin's Circuit of the Americas. Of course, it's all just a run-up to the actual United States Grand Prix on Sunday, but we'll be happy with this right now. As in the past liveblogging sessions, this session is 90 minutes in length. I'll be using the time remaining as the time notation: if you see (1:02:30), that means 27.5 minutes have gone by in the session. Read from (1:30:00). Do not taunt kimiraikkonen. If kimiraikkonen begins to smoke, seek shelter and cover head. Kimiraikkonen may suddenly accelerate to dangerous speeds. Accept no substitutes! (1:30:00) The track is open! The first man officially to enter the circuit is... Tim O'Glockenspiel? Rock on! (1:26:55) Felipe Massa: "I'ts very slippery track, very slippery." Well, yeah. (1:25:53) Oh no... The Legendary Announce Team is going to call Turn 1 "Phil Hill." Shoot me now. (1:23:30) Nico Hulkenberg: "It's worse than rain... it's like the tires aren't even turning, it's so slippery." (1:22:44) What's Phil Hill look like from the cockpit? Yeah, kinda like that... haven't quite reached the apex. Track? What track? It just sorta disappears. Post contains 969 words, total size 7 kb. 1 Gotta admit, that looks pretty neat. And I'm glad you have a race (and track) to be excited about, after some of the doldrums earlier this season. 2 I'm with you WD, I'm getting excited about Sunday too..
3 I wonder how this track would be driving clockwise? Roaring down off that hill and down the pit straight would be a lot of fun. Just look at that. I'm giggling just thinking about what's going to happen when the lights go out on Sunday. If I'm not wrong, this shot seems to be from the inside of Turn 14 looking across at Turn 1. My word, this is gonna be fun! 1 Indeed, a blind turn over the crest of a hill is always a recipe for "fun". Making it the first turn of a Formula 1 Grand Prix is *really* over the top. Please continue to put forth every effort in this worthy endeavor. 3 Making it the first turn of a Formula 1 Grand Prix is *really* over the top. F1 on SPEED! : UNITED STATES! WOO! FINALLY! We already know about Turn 1, the blind apex of which is the highest point on the track. It then immediately drops back down somewhat on the approach to Turn 2 and stays flat through to about Turn 7. You then go up and down a smidge until you reach the hairpin at the far end of the circuit. There's a small amount of down and up on the long straight, but it stays billiard-table-smooth from there until Turn 18. From 18 to the final turn is a gentle downslope taking us down to the lowest point, the start/finish line. Me likey. Me likey lots. I probably like it because of the way that Tilke blatantly stole the best parts of other circuits to make this one. The two obvious examples are the Turn 3-4-5 complex, which is lifted from Silverstone's Maggots-Becketts-Chapel, and the rebirth of Turkey's Quad-8 at 16-17-18 here. I'm willing to bet that every F1 fan has put together a "dream circuit" using their favorite turns from various tracks (mine has a nasty, nasty sequence of Spa's Eau Rouge leading to Laguna Seca's Corkscrew... I call it the "Screw Eau")... Hermann Tilke just got to build his. The hard part is trying to figure out just how the circuit will race, and it's a problem that every team is going to have to figure out, and fast. My guess, and it's only a guess based on nothing more than a visual similarity, is that it'll be like India; really fast, but without as much dust. It's clear that nobody has the faintest idea; Pirelli probably has the most experience here, and they're bringing the Hard and Medium compounds. That's the most conservative choice they can make, and it's simply because nobody knows what'll happen once you get 24 cars pounding around leaving rubber behind. In fact, Pirelli has given the teams an extra set of tires for Friday, to encourage them to go out and pound around the circuit even more than they normally would. Pirelli also believes that the asphalt is abrasive enough to call for the two hardest compounds... my guess is that next year, we'll see the Hard and Soft tires here. Unless it rains. If it rains, of course, all bets are off and all we'll be able to do is buckle up and hold on. NOAA is saying that there's a 20% chance of rain Saturday and Sunday. For once, I don't want it to rain on raceday: I wanna see this track the way it's meant to be raced. Thank you, Legendary Announce Team. Thank you very much. They'll also be streaming live in-car cameras on the website, so watch with your laptop open and running... I will be! I've taken Friday off from the Duck U Bookstore, and will be positioned on the couch watching it all as it happens (and I'm considering buying a new TV for it, too)... see you then! 1 I want to drive this!!! Must find a sim with it! 2 Tom, the only one I know about that has it is F1 2012. 3 So there's a new track, it's practically local, it looks like F1's Greatest Turns, the championship is on the line, possibility of rogue weather... could be a great race! Looking forward to it. 5 Oh, Thanks WD! I had been eyeing F1 2012 a bit, but hadn't looked closely enough to see which tracks were in it. I want to go, but I can't get away from work to drive from the D/FW metroplex down for the event. 7 Not quite the LAT, but close. NBC has hired Hobbs and Matchet, and will be replacing Varsha with Leigh Diffey. Apparently Varsha was contractually unavailable, when he's available in 2014 he might rejoin the show and we'll have the LAT again. 8 Yeah, I saw that comment somewhere... I know it wasn't anyplace official, like NBCSN's website. Yeah, The Varsha is still signed to Fox Sports thru next year. Hope it's right, though... Diffey is a decent enough Not-Varsha. Abu Dhabi 2012: How F1 SHOULD Be. What an extraordinary race that was! It's going to take me some time to adequately write this one up... it had everything a race fan could ask for, up to but fortunately NOT including fisticuffs. That was about the only thing lacking, however. As a reminder, no discussion of the race until the F1U! is posted. I'm pretty laid back about stuff in my comment section, but not about F1 results, and definitely not about this race. I will break out the banhammer and I will use it. Please don't make me. Don't even hint about the results. While you're waiting, here's the new McLaren Tooned! for your enjoyment. 1 I stayed up to watch. Well worth it! 2 Sure was not expecting a race of that quality. Fun race to watch too. 3 Is that really Mika Hakkinen doing the voice acting in that episode of Tooned? He isn't credited at the start, but it sounds like him (to my tin ears, anyway), and Tooned is the sort of thing that would appeal to his sense of humour. OTOH, being a great race driver and being a miserable voice actor are not mutually exclusive things, as the Wonderduck once pointed out ("Slappy, you can drive, but you can't act worth a damn."). So a lot of things happened at once here, so let's run them down. First, the pit wall called Vettel and told him (with some energy, I might add) to "park the car, park the car." Quickly thereafter, the indicator on his steering wheel showed a shift from Third gear directly to Neutral. Then in an interview afterwards, Christian Horner, team honcho for Red Bull, told SKY that "the engine provider told us to stop." So many possible penalties to look for... gearbox change (for the jump from 3 to N), engine change (the cars are in parc ferme condition), unable to get back to the pit lane after Quals (Hamilton lost pole position in Barcalounger for that one), and too many engines used (this was Vettel's eight and final allotted engine on the season). HWCBN(UCC) has got to be awfully happy at this possibility. I know I am. More to the point, the Ferrari driver may have an opening to cut the lead back down to single-digits or even take a lead again. We won't know for a while what, if anything, will happen to Vettel; I'll keep an eye out and update as information warrants. UPDATE: Vettel has been sent to the back of the grid for violating Article 6.6.2 of the Technical Regulations, which states that any car at the end of Q3 must have a liter of fuel available for testing. Not making it back to the pits under its own power is also a violation, but if the team can explain why it needed to be stopped, it is often allowed, and that's what occurred here. However, once Scrutineering got a hold of it, there wasn't enough fuel... depending on whose explanation you read, there was either 850ml or 150ml left in the tank. As a result, Vettel is sent to the back of the grid. However, the team immediately broke parc ferme to attempt to repair whatever required him to stop on track, and he'll be starting from the pit lane instead. If HWCBN(UCC) is going to have a chance at the Championship, he has got to make this opportunity count. Post contains 649 words, total size 19 kb. 1 Very impressed with both the RB & McLaren's tires. Both teams are keeping the max potential going. Ferrari, Lotus & Williams look just a 1/4 step behind in degradation after P4. I really do hope this is a interesting race. 2 Well, the last time someone got booted to the back of the grid, Hakham Maldonado got the win, then the Williams garage area exploded. If past results are anything to go by, it'll be a VERY interesting race. I've come to the conclusion that I don't really care about this practice session. It's been a long, crappy day at the end of a long, crappy week leading into next week when I have inventory. I only just got home from a day that started when I accidentally gave myself half a Hitler mustache, and to be honest, I don't want to watch the remaining 45 minutes of a practice session that I watched half of live. Ready for the news about the session? Vettel was fastest ahead of the two McLarens. Tah-dah! Yes, I know what I sound like. I sound like someone tired and cranky and grumpy and tired of wondering by how much Seb Vettel is going to win by. We started the season off with seven different winners in the first seven races. We might end the season with ONE winner for the last seven races. Darn it. Quals in the morning, and I'll be better for that. I promise, my fellow F1 fans. 1 I was going to say that maybe there will be a little rain to liven things up, but then I remembered that it is in Abu Dhabi. Hope for a dusty track? 2 This link goes to a interactive view of a full lap in a Red Bull F1 car. I found very fun to watch & play with. 3 *passes WD a duck. * There, you have a duck on your head. Your day will be better now. 126kb generated in CPU 0.09, elapsed 0.2333 seconds. 55 queries taking 0.1624 seconds, 287 records returned.